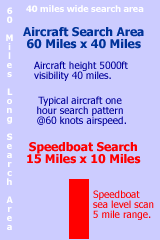 Speedboat searches option .………….for short distances limited by daylight and sea state, very few of the local boats have GPS or compass, their average range is 70 miles and cruise speed is 20 knots, effective scan area is about 5 miles to port and starboard, down to 2 miles or less in rough seas. A 70 mile or 4 hours will cost around 20,000 B. Aircraft sea searches..……..;By far the best choice to locate recover your missing boat, normal visibility is twenty miles from 5000ft, aircraft speed of 60 to 140 miles per hour, with 10 mile scan area, speed at 1 to 2 miles a minute, aircraft can descend to identify boat, aircraft GPS will fix vessels position to calculate wind, current and tide drift to send a salvage vessel. Co-ordination is vital to any rescue. Get our club organize your search, we have the local contacts, knowledge of winds, currents and tides to know where to look for your boat, searches are limited to daylight hours so time is critical, . We have salvage capabilities; if you boat is on the rocks or beach, or sinking call Brent on his mobile 0819701062, we have emergency pumps available with the expertise needed to salvage your boat.